Swim2000 Returns Instruction - Contact us with any questions! At the bottom left of the screen, click the return link. Log into your account, find the order you wish to return, and click the Return/Exchange button. Out of the items on the order, choose the ones you wish to return/exchange and whether or not they are defective. Continue to the next step. Choose the reason for the return (if not defective) and a specific comment, detailing the reason for each item. Continue to next step. If exchanging, choose the type of exchange you wish to perform. You can choose the same item, the same item with a different size or style, a new item based on a product id, or you can shop for a new item on the website. Continue to next step. If you have to pay a difference, you will be sent to the checkout process. When you finish that, or if you owe no extra, you will be brought to a confirmation page. 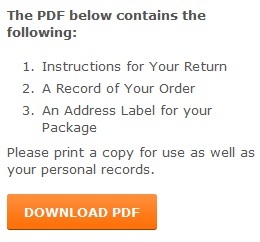 Here, you can print a pdf that will outline the instructions for a return.